There are few things I love more than well marked Brindle Pied French Bulldogs. Among serious breeders, pied is the “Rolls Royce” of French Bulldog color patterns – easy to achieve in theory (just breed two pieds together, and you’ll get more pieds), but nearly impossible to achieve perfectly. Brindle Pied French Bulldogs, after all, have no camouflage. A solid patterned dog, be it brindle, cream or fawn, has the benefit of a canvas in a single color. A pied needs not to have not just markings, but markings well placed, symmetrically located, and properly pigmented. A badly placed marking on the back can give a structurally correct dog the appearance of a sway back. A lopsided marking on a rear leg can make movement look off gait. A non symmetrical head marking can detract from a dog’s appearance and overall type. Worst of all, lack of pigment, even when unseen, can have serious health ramifications for a pied dog, no matter how pretty they look. 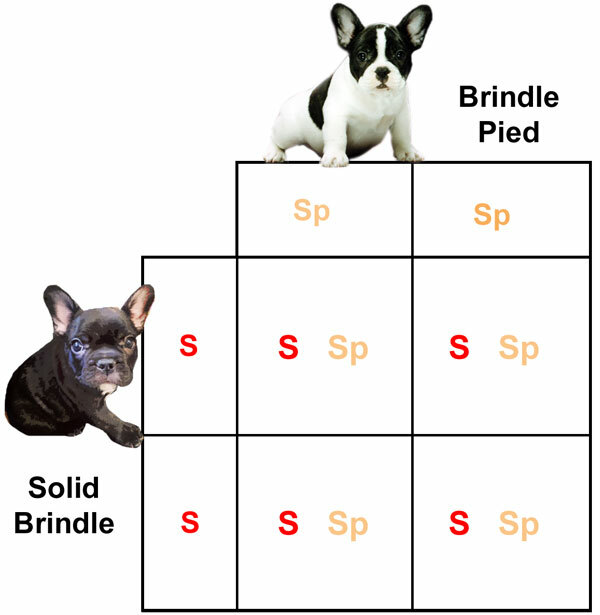 The pied pattern is recessive to that for solid coat (solid coat includes fawn, cream and brindle – and more about brindle later). 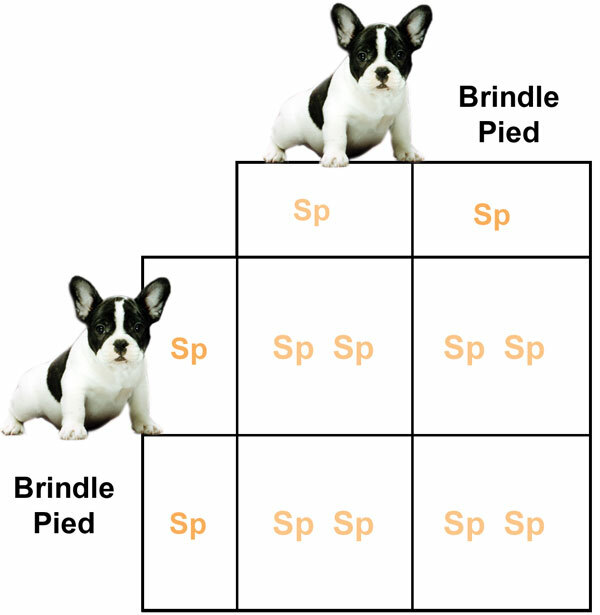 A Punnett Square can help you visualize the possible breedings that would result in a pied dog. Click any images to view full sized. Breeding pied to pied will have an outcome of 100% pied offspring. We could expect 50% of the puppies produced to be pied. The other 50% we would expect to be solid marked dogs that CARRY the recessive pied allele. So, 25% would be solid marked offspring that do NOT carry pied. 50% would be solid marked offspring that DO carry a pied allele. 25% would be pied offspring. Pied, as you might know, is a wide spectrum of marking types. A heavily marked pied dog can be referred to as a blanket, boston marked, or mantled pied, while an ‘extreme’ pied can be a dog that appears essentially white. This is a diagram that I’ve always found really helpful in understanding pied patterning. It’s adapted from a diagram by G. M. Allen, published in 1914, and is considered to be the ‘blueprint’ for how pied markings pattern themselves. 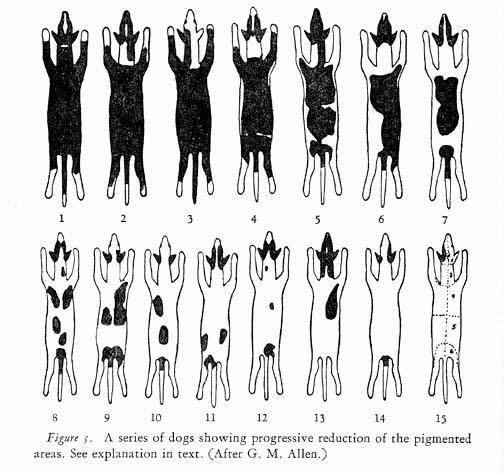 As you can see, the drawing even in 1914 specified that pied is an ABSENCE of patterned areas, and an increase in white (I mention that only because sometimes people think that a pied dog is a white dog with patterned areas overlaid). 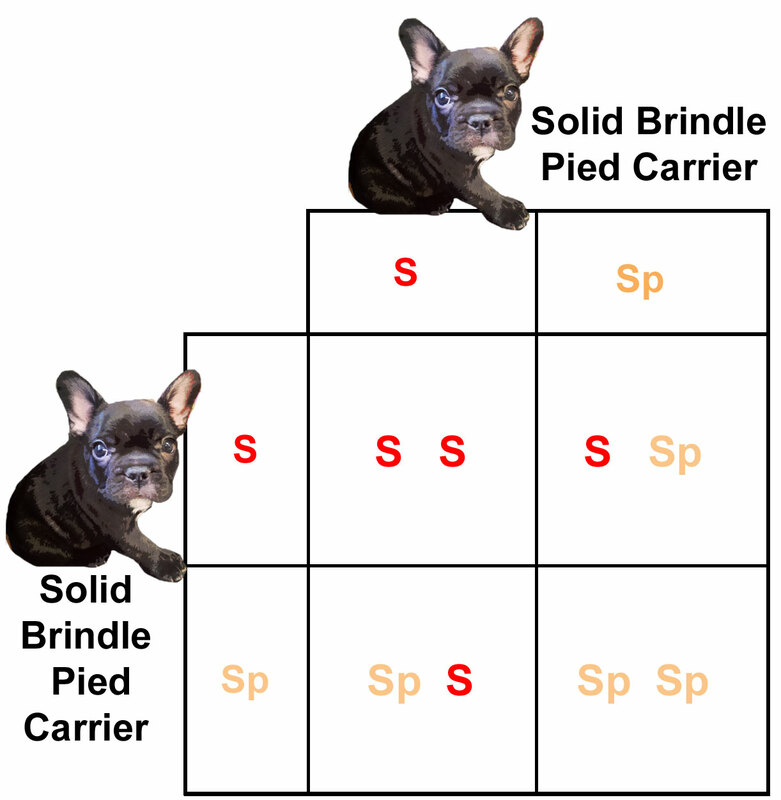 In Frenchies, this drawing would illustrate a brindle pied Frenchie. If you picture all of those same areas as fawn, without a brindle overlay, you can picture a fawn pied with the same markings. The masking allele is separate and separately inherited. The further you go down this chart, away from patterned areas and towards extreme white, the greater your chances for color linked deafness. Color linked deafness is an interesting thing. Its technical name is “pigment-associated hereditary deafness”. The cochlea is the spiral cavity of the inner ear, and it is lined with cochlear hair cells. These hair cells, when healthy, generates and amplify sound. In pigment-associated hereditary deafness, the death of the hair cells after birth (2-4 weeks, for dogs) leads to deafness. These hair cells and the underlying structure require a very specific environment to remain healthy – specifically, high K+ and low Na+ levels. Pigment cells – melanocytes – are responsible for maintaining this level. When the cochlea has no pigment cells, the stria degenerates, and the high K+ levels in the fluids surrounding the hair cells is not maintained. This leads to the eventual death of the cochlear hair cells, and to deafness in the dog. Anything that increases the chances of less pigmented inner ears, increases the chances of pigment associated deafness. As you can see on the pied inheritance chart above, Mother Nature does everything in her power to retain pigment on the ear, which decreases the chances for deafness (but does not eliminate it – a dog with pigmented or colored hair on the ears, can still have no pigment on the inner ears).